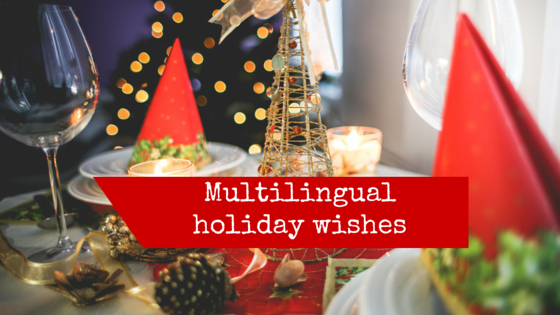 The Savvy Newcomer team would like to wish you happy holidays in some of the languages our team members know. Thanks for interacting with us in 2015, and we look forward to staying in touch in 2016. 2015 has been a fantastic year to share with you! We’ve traversed the seas of translation and interpreting and covered as many topics as we could dream up. The holidays can be a good time to slow down and see what is most helpful to you. This year, our team grew and got more hands on as we shared personal stories about our growth in different areas. We look forward to staying in touch with you in 2016 and continuing to promote professional growth, and in particular helping those starting off in the profession find a realistic, practical and successful approach. From our hearts to yours, have a wonderful holiday season with your loved ones. Feel free to share holiday wishes and Christmas carols in your language in the Comments section below. We look forward to hearing from you! Thank you for this fun post. And thanks for your continued support to my blog this year. I wish you the best of the best for the New Year! Patricia.